Looking for professional power washing services? Do you know how to choose the best company for the job? If you’ve never hired pressure washing services it can be difficult to know what you should be looking for. However, not every company is created equally and can offer the results you need. Luckily, there are a few tricks for finding the best. Below are the 5 questions you need to ask a power washing professional before hiring them. 1. What is Your Power Washing Process? Pressure washing isn’t as simple as you may believe. It’s important that a professional washer uses the right amount of pressure and doesn’t cause any damage to your vinyl siding, roofing, or other parts of your building. Not all surfacesare ideal for being washed with pressure washers. Ask any pressure washing service you’re considering more about their methods. Make sure that they’ll take care of the delicate surfaces of your home rather than going full blast at all times. 2. What Suggestions Do You Have For Washing Windows? Some pressure washers will offer to clean your windows along with the rest of your home or commercial building, but it can be a mistake to take them up on their offer. Even with a low pressure, washing windows with a power washer can lead to big problems and costly mistakes. If they offer window washing services along with their pressure washing, make sure that they’re using a more delicate process for the windows instead of treating it similarly to any other part of your home. 3. What Proof Do You Have For the Quality of Your Work? Don’t choose a pressure washing professional unless you’ve verified first that they’re the real deal and can do what they promise. A great way to do this is to ask them for before and after pictures. Ask if they can show you exactly what you can expect from your own building or home once the job is completed. In addition to photos, see if they have references or look at client reviews and testimonials online to see what others have to say about them. 4. Do You Have Insurance to Cover Your Workers? Pressure washing can be a dangerous business. This makes for a great reason not to do the work yourself. However, even professionals can get injured from time to time while on the job. 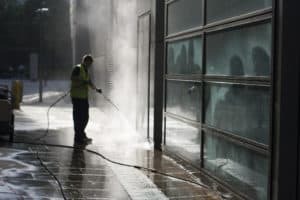 For this reason, it’s crucial that you find out if the pressure washing company covers their workers with liability insurance. If they don’t have insurance, it’s possible that in some cases you could be held liable for medical expenses and any injuries or accidents that occur. 5. What Guarantee is Offered For Your Work? You should also find out if the pressure washing professionals offer any sort of guarantees for their work on your home or building. A professional company will offer a strong guarantee for their work and stand by their services. If you aren’t satisfied with the end result within a certain time frame, you should be able to get your money back. A professional and thorough pressure washing job can greatly change the way a building looks for the better. However, not all pressure washing companies can deliver what they promise. Be sure to ask the above questions before hiring any professionals and you’ll be sure to have the best chance of making the right hiring decision. Looking for power washing services in Tennessee? Contact us today to learn more about what Pro Wash LLC can do for you.